Space for visiualization is always limited. 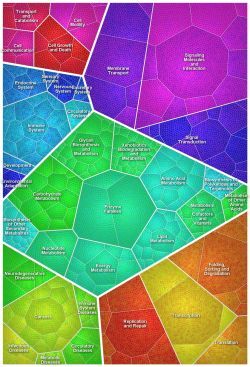 A very promising technology to show hierarchically organized data on a very compressed, while still intuitively understood way are Voronoi Tree Maps. That's what we thought when starting a project to translate this technology into a product. Quantitative data may be grouped by function to make them available for further interpretation and analysis. 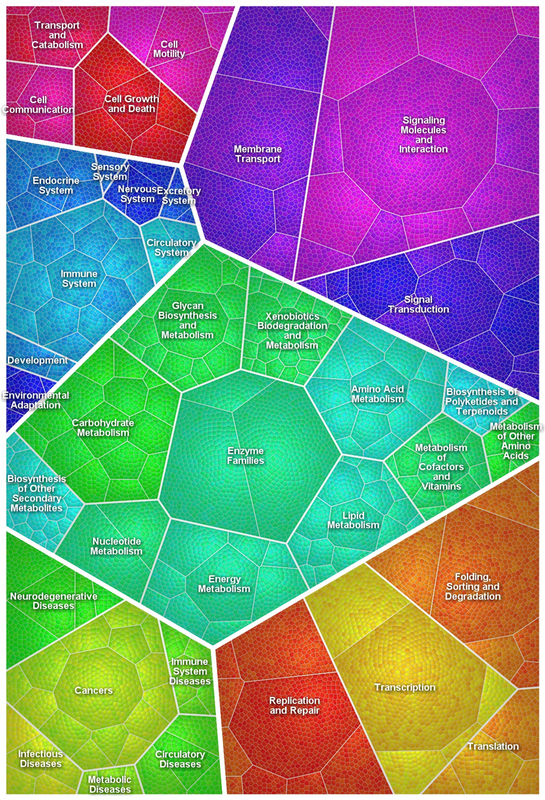 This allows you to find interesting functional coherencies within biological systems and discover new patterns never seen before in your data. Paver presents your expression data with hierarchically organized data from KEGG, Gene Onthology or others. This allows you to quickly identify the different classes and subclasses. Additionally, classes and subclasses across all hierarchy levels are shown as convex objects making it easy to distinguish between classes of the same level easily. Your screen space is limited. Therefore, Paver allows for defining a certain size of the desired image. Your data is then mapped into this area making use of every single available pixel.